RRC in collaboration with the University of Trás-os-Montes and Alto Douro, have been working to create a new, free application to record River Habitat Survey (RHS) sites in the field, using your smartphone. 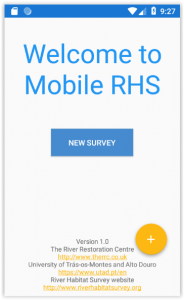 It works on Android phones and tablets, and the simple interface makes it easy to input data similar to how you would have originally completed the paper form. Just work your way through the sections on the App, filling in information at each Spot Check, recording the number of riffles, pools and bars, before carrying out the Sweep Up assessment of the overall reach. 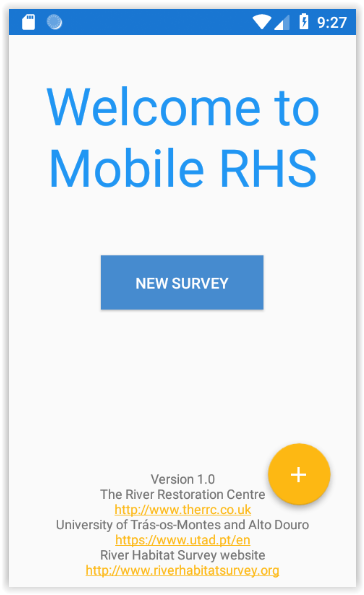 The user can also take photographs to be added to the survey, and the data can be exported to the RHS Toolbox and RAPID2 software. Natural Resources Wales, working with the River Restoration Centre and Bournemouth University, have recently published analysis of River Habitat Survey data from the repeat baseline survey in 2007-9 for six areas across Wales, allowing comparisons to be drawn in terms of levels of modifications and habitat quality. The analyses and indices from this report will be invaluable for Area Based Statements as well as providing evidence for our management and prioritisation of rivers. River restoration is a key priority for NRW and this report suggests a way forward for the assessment of restoration projects as well as modificaitions such as hydropower proposals. 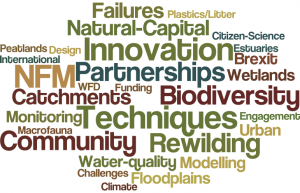 Each year the River Restoration Centre (RRC) holds an Annual Network Conference that brings together professionals from all areas of river restoration including contractors, engineers, consultants, academics, and representatives from trusts, local organisations, and goverment agencies. The event is run over two days and includes around 50 speakers, workshop sessions and many other opportunities to network and make new contacts. Speakers present interesting, engaging presentations on their research or recent projects on current, hot topics.